Arcturus (/ɑːrkˈtjʊərəs/), also designated Alpha Boötis (α Boötis, abbreviated Alpha Boo, α Boo) is a star in the constellation of Boötes. It is relatively close at 36.7 light-years from the Sun. Together with Spica and Denebola (or Regulus, depending on the source), Arcturus is part of the Spring Triangle asterism and, by extension, also of the Great Diamond along with the star Cor Caroli. 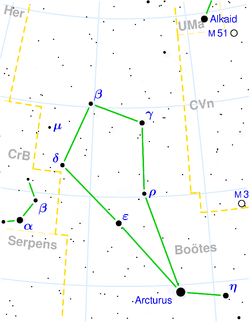 α Boötis (Latinised to Alpha Boötis) is the star's Bayer designation. The traditional name Arcturus derives from Ancient Greek Ἀρκτοῦρος (Arktouros) and means "Guardian of the Bear", ultimately from ἄρκτος (arktos), "bear" and οὖρος (ouros), "watcher, guardian". It has been known by this name since at least the time of Hesiod. This is a reference to its being the brightest star in the constellation of Boötes (of which it forms the left foot), which is next to the constellations of Ursa Major and Ursa Minor, the Greater and Lesser Bears. In 2016, the International Astronomical Union organized a Working Group on Star Names (WGSN) to catalog and standardize proper names for stars. The WGSN's first bulletin of July 2016 included a table of the first two batches of names approved by the WGSN; which included Arcturus for this star. It is now so entered in the IAU Catalog of Star Names. 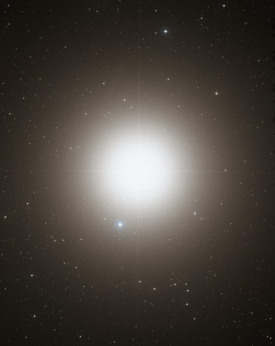 With an apparent visual magnitude of −0.05, Arcturus is the brightest star in the Northern celestial hemisphere and the fourth-brightest star in the night sky, after Sirius (−1.46 apparent magnitude), Canopus (−0.86) and Alpha Centauri (−0.27). However, Alpha Centauri is a binary star, whose unresolved components to the naked eye are both fainter than Arcturus. This makes Arcturus the third-brightest individual star, just ahead of Alpha Centauri A, whose apparent magnitude is −0.01. The French mathematician and astronomer Jean-Baptiste Morin observed Arcturus in the daytime with a telescope (a first for any star other than the Sun and supernovae) in 1635, and Arcturus has been seen at or just before sunset with the naked eye. Arcturus is visible from both Earth's hemispheres as it is located 19° north of the celestial equator. The star culminates at midnight on 27 April, and at 9PM on June 10 being visible during the late northern spring or the southern autumn. From the northern hemisphere, an easy way to find Arcturus is to follow the arc of the handle of the Big Dipper (Plough). By continuing in this path, one can find Spica, "Arc to Arcturus, then spike to Spica". Ptolemy described Arcturus as subrufa ("slightly red"): it has a B-V color index of +1.23, roughly midway between Pollux (B-V +1.00) and Aldebaran (B-V +1.54). Eta Boötis, or Muphrid, is only 3.3 light-years distant from Arcturus, and would have a visual magnitude −2.5, whereas an observer on the former system would find Arcturus as bright as Venus as seen from Earth. Based upon an annual parallax shift of 88.83 milliarcseconds as measured by the Hipparcos satellite, Arcturus is 36.7 light-years (11.26 parsecs) from the Sun (the margin of error is 0.54 milliarcseconds, translating to a margin of error of ±0.23 light-years (0.069 parsecs)). Arcturus is a type K0 III red giant star. With an absolute magnitude of −0.30 it is, together with Vega and Sirius, one of the most luminous stars in the Sun's neighborhood. It is about 110 times brighter than the Sun in visible light wavelengths, but this underestimates its strength as much of the light it gives off is in the infrared; total (bolometric) power output is about 180 times that of the Sun. The lower output in visible light is due to a lower efficacy as the star has a lower surface temperature than the Sun. With a near-infrared J band magnitude of −2.2, only Betelgeuse (−2.9) and R Doradus (−2.6) are brighter. As the brightest K-type giant in the sky, it was the subject of an atlas of its visible spectrum, made from photographic spectra taken with the coudé spectrograph of the Mt. Wilson 2.5m telescope published in 1968, a key reference work for stellar spectroscopy. Subsequent spectral atlases    with greater wavelength coverage and superior signal-to-noise ratio made with digital detectors have supplanted the older work, but the Arcturus spectrum remains an important standard for stellar spectroscopy. As a single star, the mass of Arcturus cannot be measured directly, but models suggest it is slightly larger than that of the Sun. Evolutionary matching to the observed physical parameters gives a mass of 1.08 ± 0.06 M☉, while the oxygen isotope ratio for a first Dredge-up star gives a mass of 1.2 M☉. Arcturus has been estimated to be around 6 billion to 8.5 billion years old, and is ascending the red giant branch until it accumulates a large enough degenerate helium core to ignite the helium flash. It has likely exhausted the hydrogen from its core and is now in its active hydrogen shell burning phase. It will continue to expand before entering horizontal branch stage of its life cycle. As one of the brightest stars in the sky, Arcturus has been the subject of a number of studies in the emerging field of asteroseismology. Belmonte and colleagues carried out a radial velocity (Doppler shift of spectral lines) study of the star in April and May 1988, which showed variability with a frequency of the order of a few microhertz, the highest peak corresponding to 4.3 μHz (2.7 days) with an amplitude of 60 ms−1, with a frequency separation of c. 5 μHz. They suggested that the most plausible explanation for the variability of Arcturus is stellar oscillations. Asteroseismological measurements allow direct calculation of the mass and radius, giving values of 0.8 ± 0.2 M☉ and 27.9 ± 3.4 R☉. This form of modelling is still relatively inaccurate, but a useful check on other models. Astronomers term "metals" those elements with higher atomic numbers than helium. Arcturus has an enrichment of alpha elements relative to iron but only about a third of solar metallicity, Arcturus is possibly a Population II star. In antiquity, Arcturus was closer to the centre of the constellation. Hipparcos also suggested that Arcturus is a binary star, with the companion about twenty times dimmer than the primary and orbiting close enough to be at the very limits of humans' current ability to make it out. Recent results remain inconclusive, but do support the marginal Hipparcos detection of a binary companion. In 1993, radial velocity measurements of Aldebaran, Arcturus and Pollux showed that Arcturus exhibited a long-period radial velocity oscillation, which could be interpreted as a substellar companion. This substellar object would be nearly 12 times the mass of Jupiter and be located roughly at the same orbital distance from Arcturus as the Earth is from the Sun, at 1.1 Astronomical Units. However, all three stars surveyed showed similar oscillations yielding similar companion masses, and the authors concluded that the variation was likely to be intrinsic to the star rather than due to the gravitational effect of a companion. So far no substellar companion has been confirmed. In Arabic, Arcturus is one of two stars called al-simāk "the uplifted one" (the other is Spica). Arcturus is specified as السماك الرامح as-simāk ar-rāmiħ "the uplifted one of the lancer". The term Al Simak Al Ramih has appeared in Al Achsasi Al Mouakket catalogue (translated into Latin as Al Simak Lanceator). This has been variously romanized in the past, leading to obsolete variants such as Aramec and Azimech. For example, the name Alramih is used in Geoffrey Chaucer's Treatise on the Astrolabe (1391). Another Arabic name is Haris-el-sema, from حارس السماء ħāris al-samā’ "the keeper of heaven". or حارس الشمال ħāris al-shamāl’ "the keeper of north". Arcturus was once again called by its classical name from the Renaissance onwards. In Chinese astronomy, Arcturus is called Da Jiao (Chinese: 大角; pinyin: Dàjiǎo; literally: "great horn"), because it is the brightest star in the Chinese constellation called Jiao Xiu (Chinese: 角宿; pinyin: Jiǎo Xiǔ; literally: "horn star"). Later it become a part of another constellation Kang Xiu (Chinese: 亢宿; pinyin: Kàng Xiǔ). In Indian Astrology or Vedic Astrology or Sidereal Astrology, Arcturus is called Swati which is a word meaning "very beneficent" derived from the language Sanskrit. It is the eponymous star of one of the nakshatras (lunar mansions) of Hindu astrology. In Indonesia, Arcturus is called Bintang Biduk (star of boat). In Japan, Arcturus is called Mugi-boshi (麦星), meaning star of wheat. In Inuit astronomy, Arcturus is called the Old Man (Uttuqalualuk in Inuit) and The First Ones (Sivulliik in Inuit). The Mi'kmaq of eastern Canada saw Arcturus as Kookoogwéss, the owl. Arcturus had several names that described its significance to indigenous Polynesians. In the Society Islands, Arcturus, called Ana-tahua-taata-metua-te-tupu-mavae ("a pillar to stand by"), was one of the ten "pillars of the sky", bright stars that represented the ten heavens of the Tahitian afterlife. In Hawaii, the pattern of Boötes was called Hoku-iwa, meaning "stars of the frigate bird". This constellation marked the path for Hawaiiloa on his return to Hawaii from the South Pacific Ocean. The Hawaiians called Arcturus Hoku-leʻa. It was equated to the Tuamotuan constellation Te Kiva, meaning "frigate-bird", which could either represent the figure of Boötes or just Arcturus. However, Arcturus may instead be the Tuamotuan star called Turu. The Hawaiian name for Arcturus as a single star was likely Hoku-leʻa, which means "star of gladness", or "clear star". In the Marquesas Islands, Arcturus was probably called Tau-tou and was the star that ruled the month approximating January. The Maori and Moriori called it Tautoru, a variant of the Marquesan name and a name shared with Orion's Belt. As one of the brightest stars in the sky, Arcturus has been significant to observers since antiquity. In ancient Mesopotamia, it was linked to the god Enlil, and also known as Shudun, "yoke", or SHU-PA of unknown derivation in the Three Stars Each Babylonian star catalogues and later MUL.APIN around 1100 BC. In Ancient Rome, the star's celestial activity was supposed to portend tempestuous weather, and a personification of the star acts as narrator of the prologue to Plautus' comedy Rudens (circa 211 BC). In the Hebrew scriptures Arcturus is referred to in Job 38:32. In the Middle Ages, Arcturus was considered a Behenian fixed star and attributed to the stone Jasper and the plantain herb. Cornelius Agrippa listed its kabbalistic sign under the alternate name Alchameth. Arcturus achieved fame when its light was rumored to be the mechanism used to open the 1933 Chicago World's Fair. The star was chosen as it was thought that light from Arcturus had started its journey at about the time of the previous Chicago World's Fair in 1893 (at 36.7 light-years away, and the light actually started in 1896. Arcturus is believed to be the gateway for the soul by believers in New Age religion. 1 2 3 4 5 van Leeuwen, F. (November 2007). "Validation of the new Hipparcos reduction". Astronomy and Astrophysics. 474 (2): 653–64. arXiv:0708.1752 . Bibcode:2007A&A...474..653V. doi:10.1051/0004-6361:20078357. 1 2 3 4 5 Ducati, J. R. (2002). "VizieR Online Data Catalog: Catalogue of Stellar Photometry in Johnson's 11-color system". CDS/ADC Collection of Electronic Catalogues. 2237: 0. Bibcode:2002yCat.2237....0D. ↑ Gray, R. O.; Corbally, C. J.; Garrison, R. F.; McFadden, M. T.; Robinson, P. E. (2003). "Contributions to the Nearby Stars (NStars) Project: Spectroscopy of Stars Earlier than M0 within 40 Parsecs: The Northern Sample. I". The Astronomical Journal. 126 (4): 2048. arXiv:astro-ph/0308182 . Bibcode:2003AJ....126.2048G. doi:10.1086/378365. 1 2 Perryman; et al. (1997). "HIP 69673". The Hipparcos and Tycho Catalogues. 1 2 Carney, Bruce W.; et al. (March 2008). "Rotation and Macroturbulence in Metal-Poor Field Red Giant and Red Horizontal Branch Stars". The Astronomical Journal. 135 (3): 892–906. arXiv:0711.4984 . Bibcode:2008AJ....135..892C. doi:10.1088/0004-6256/135/3/892. 1 2 3 4 5 6 7 8 I. Ramírez; C. Allende Prieto (December 2011). "Fundamental Parameters and Chemical Composition of Arcturus". The Astrophysical Journal. 743 (2): 135. arXiv:1109.4425 . Bibcode:2011ApJ...743..135R. doi:10.1088/0004-637X/743/2/135. ↑ Schröder, K.-P.; Cuntz, M. (April 2007). "A critical test of empirical mass loss formulas applied to individual giants and supergiants". Astronomy and Astrophysics. 465 (2): 593–601. arXiv:astro-ph/0702172 . Bibcode:2007A&A...465..593S. doi:10.1051/0004-6361:20066633. 1 2 3 Rogers, John H. (1998). "Origins of the Ancient Constellations: II. The Mediterranean Traditions". Journal of the British Astronomical Association. 108 (2): 79–89. Bibcode:1998JBAA..108...79R. ↑ Kaler, James B. (2002). The Hundred Greatest Stars. New York, New York: Copernicus Books. p. 21. ISBN 0-387-95436-8. 1 2 3 4 5 Schaaf, Fred (2008). The Brightest Stars: Discovering the Universe Through the Sky's Most Brilliant Stars. Hoboken, New Jersey: John Wiley and Sons. pp. 126–36. ISBN 978-0-471-70410-2. ↑ Hinkle, Kenneth; Wallace, Lloyd; Valenti, Jeff; Harmer, Dianne (2000). Visible and Near Infrared Atlas of the Arcturus Spectrum 3727-9300 Å. San Francisco: Astronomical Society of the Pacific. Bibcode:2000vnia.book.....H. ISBN 1-58381-037-4. ↑ Hinkle, Kenneth; Wallace, Lloyd; Livingston, William Charles (1995). Infrared atlas of the Arcturus spectrum, 0.9-5.3 microns. San Francisco: Astronomical Society of the Pacific. Bibcode:1995iaas.book.....H.
↑ Hinkle, Kenneth; Wallace, Lloyd; Valenti, Jeff; Ayres, Thomas (2005). Ultraviolet Atlas of the Arcturus Spectrum, 1150-3800 Å. San Francisco: Astronomical Society of the Pacific. Bibcode:2005uaas.book.....H.
↑ Abia, C.; Palmerini, S.; Busso, M.; Cristallo, S. (2012). "Carbon and oxygen isotopic ratios in Arcturus and Aldebaran. Constraining the parameters for non-convective mixing on the red giant branch". Astronomy & Astrophysics. 548: A55. arXiv:1210.1160 . Bibcode:2012A&A...548A..55A. doi:10.1051/0004-6361/201220148. ↑ Belmonte, J. A.; Jones, A. R.; Palle, P. L.; Roca Cortes, T. (1990). "Acoustic oscillations in the K2 III star Arcturus". Astrophysics and Space Science. 169 (1–2): 77–84. Bibcode:1990Ap&SS.169...77B. doi:10.1007/BF00640689. ISSN 0004-640X. ↑ Kallinger, T.; Weiss, W. W.; Barban, C.; Baudin, F.; Cameron, C.; Carrier, F.; De Ridder, J.; Goupil, M.-J. ; Gruberbauer, M.; Hatzes, A.; Hekker, S.; Samadi, R.; Deleuil, M. (2010). "Oscillating red giants in the CoRoT exofield: Asteroseismic mass and radius determination". Astronomy and Astrophysics. 509: A77. Bibcode:2010A&A...509A..77K. doi:10.1051/0004-6361/200811437. ↑ Ramya, P.; Reddy, Bacham E.; Lambert, David L. (2012). "Chemical compositions of stars in two stellar streams from the Galactic thick disc". Monthly Notices of the Royal Astronomical Society. 425 (4): 3188. arXiv:1207.0767 . Bibcode:2012MNRAS.425.3188R. doi:10.1111/j.1365-2966.2012.21677.x. ↑ Verhoelst, T.; Bordé, P. J.; Perrin, G.; Decin, L.; et al. (2005). "Is Arcturus a well-understood K giant?". Astronomy & Astrophysics. 435: 289. arXiv:astro-ph/0501669 . Bibcode:2005A&A...435..289V. doi:10.1051/0004-6361:20042356. , and see references therein. ↑ Hatzes, A.; Cochran, W. (August 1993). "Long-period radial velocity variations in three K giants". The Astrophysical Journal. 413 (1): 339–348. Bibcode:1993ApJ...413..339H. doi:10.1086/173002. ↑ Knobel, E. B. (June 1895). "Al Achsasi Al Mouakket, on a catalogue of stars in the Calendarium of Mohammad Al Achsasi Al Mouakket". Monthly Notices of the Royal Astronomical Society. 55: 429. Bibcode:1895MNRAS..55..429K. doi:10.1093/mnras/55.8.429. ↑ "List of the 25 brightest stars". Jordanian Astronomical Society. Retrieved March 28, 2007. ↑ Allen, Richard Hinckley (1936). Star-names and their meanings. pp. 100–101. ↑ Wehr, Hans (1994). Cowan, J. Milton, ed. A dictionary of modern written Arabic. ↑ Davis Jr., G. A. (October 3, 1944). "The Pronunciations, Derivations, and Meanings of a Selected List of Star Names". Popular Astronomy. LII: 13. Bibcode:1944PA.....52....8D. ↑ Kunitzsch, Paul; Smart, Tim (2006). A Dictionary of Modern star Names: A Short Guide to 254 Star Names and Their Derivations (2nd rev. ed.). Cambridge, MA: Sky Pub. p. 19. ISBN 978-1-931559-44-7. 1 2 Mudrooroo (1994). Aboriginal mythology : an A-Z spanning the history of aboriginal mythology from the earliest legends to the present day. London: HarperCollins. p. 5. ISBN 1-85538-306-3. ↑ Hamacher, Duane W.; Frew, David J. (2010). "An Aboriginal Australian Record of the Great Eruption of Eta Carinae" (PDF). Journal of Astronomical History & Heritage. 13 (3): 220–34. arXiv:1010.4610 . Bibcode:2010JAHH...13..220H. 1 2 Johnson, Diane (1998). Night skies of aboriginal Australia: a noctuary. Darlington, New South Wales: University of Sydney. pp. 24, 69, 84, 112. ISBN 1-86451-356-X. ↑ Hagar, Stansbury (1900). "The Celestial Bear". The Journal of American Folklore. 13 (49): 92–103. doi:10.2307/533799. JSTOR 533799. ↑ Makemson 1941, p. 199. ↑ Makemson 1941, p. 209. ↑ Makemson 1941, p. 280. ↑ Makemson 1941, p. 221. ↑ Makemson 1941, p. 264. ↑ Makemson 1941, p. 210. ↑ Makemson 1941, p. 260. ↑ Rogers, John H. (1998). "Origins of the Ancient Constellations: I. The Mesopotamian Traditions". Journal of the British Astronomical Association. 108 (1): 9–28. Bibcode:1998JBAA..108....9R. ↑ Plautus. "Rudens". p. prol. 71. ↑ Lewis & Short. "Arcturus". Latin Dictionary. ↑ "Job 38:32". Bible Hub. ↑ "Century of Progress World's Fair, 1933-1934". University of Illinois-Chicago. January 2008. Retrieved 2009-09-06. Wikimedia Commons has media related to Arcturus.